By clicking Sign Up, you agree to our Terms and our Privace Policy. We will not publish anything without your consent. Forget your password? Don´t have an account? It´s time to become fluent! Learn a foreign language by speaking with native people while having fun. 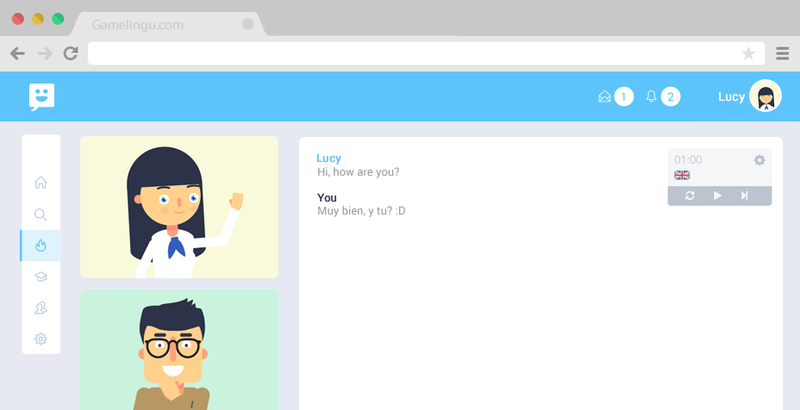 No more Skype, Gamelingu is an “all in one” platform, you only need your browser to start to speaking with your language partner. Don´t know what to say? We have fun games to break the ice and improve your speaking. We help you to find the perfect language partner. You can search users and filter the results by many parameters. Improve your pronunciation, vocabulary, grammar... and earn badges in the process. Doesn´t matter what language you are looking for. We have all of them! Keep track of your progress and learn what you need to improve. The Gamelingu community will help you achieve your goals. Are you affiliated with an educational insitution or language academy? Improve the results of your students with a customized platform.